Red Ledges, a premier four-season mountain golf community just minutes from downtown Park City, recently celebrated its Grand Opening of the first-ever Jack Nicklaus Signature 12-hole Golf Park with the acclaimed golf course designer on-hand. 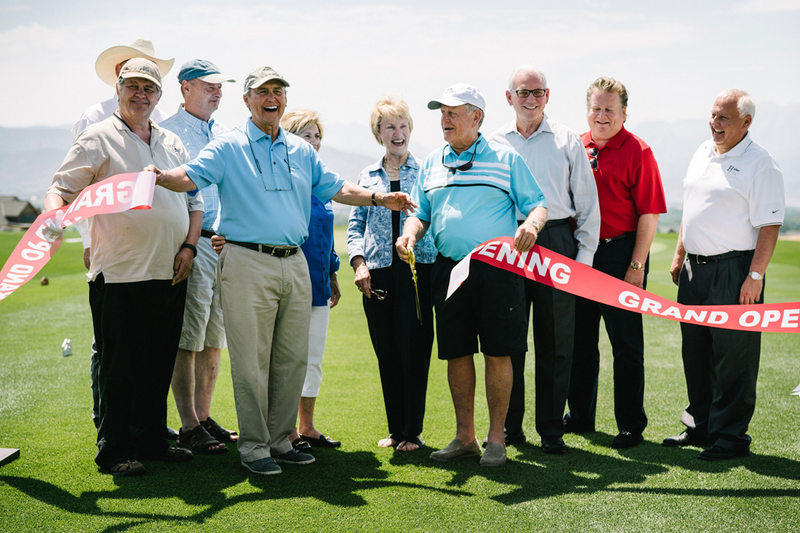 Responding to the growing trend of making golf more accessible and relevant to new, recreational, or busy players, Red Ledges has built the first-ever Jack Nicklaus Signature 12-hole Golf Park—designed to be friendly, fun and approachable in a fast-paced world. The short layout and forgiving greens encourage family-friendly play while still providing an enjoyable round for the seasoned player. There are also several innovative features including multiple cups to aim for (a traditional 4” and a larger 8”) and in additional to traditional golf carts, the park offers new and exciting single rider, skateboard/snowboard-style vehicles. The course comprises 12 par-3 holes with the total yardage ranging from 1,013 yards to 1,745. Owners specifically chose the name “Golf Park” over the traditional “golf course” because park activities like soccer, Frisbee, picnicking and dog walking are encouraged. It is a grand experiment to mix the cultures of family, park and golf. The Golden Bear helped open the Golf Park by hitting the ceremonial tee shot and then delighted members at a Q&A in order to provide further design insight. “The team at Red Ledges had originally envisioned and discussed a nine-hole course that had a mix of par-3 holes and par-4 holes, so we originally started to design such a layout,” said Nicklaus, whose championship layout at Red Ledges opened in 2009 and has been named Best Golf Course in Utah by the Best of State Awards for seven consecutive years. So in the midst of his first site visit, Nicklaus had the idea to convert the layout to 12 par-3 holes. “By designing a 12-hole, par-3 course, the member can play with a small bag or just a handful of clubs. And while it sounds simple, the course being 12 holes gives them the option of playing something a little longer than nine holes and shorter than 18 holes. Players can also break it up in a way where they can divide the layout in various ways to customize their experience—from playing as few as six holes to as many as 18,” Nicklaus said. Red Ledges is a premier private recreational mountain community in Heber Valley, Utah, featuring two Jack Nicklaus Signature Golf Courses, the Jim McLean Golf School, the Cliff Drysdale Tennis School, an extensive equestrian program, a swim and fitness club and two private member ski lounges in Deer Valley. Spanning nearly 2,000 acres in Utah’s Wasatch and Uinta mountain ranges, Red Ledges offers 1,200 estate homesites and thoughtfully designed homes with dramatic views of the unique red rock formations and surrounding Rocky Mountain peaks. For more information, visit www.redledges.com.